Our country's only certified 'water sommelier' wants to open our eyes to the misunderstood wonders of the world's most ubiquitous beverage. “It starts from extremely smooth and it can go to really complex. It can be metallic, it can be harsh, it can be fruity, it can be nutty; it can even be salty and sweet,” Martin Riese says. As our country's only certified water sommelier, Riese often describes the nuanced flavor profiles of natural spring water as if they belonged to a fine bottle of merlot. Overseeing a serious H20 menu of 20 different options at Los Angeles’ Patina Restaurant, the German national is a water iconoclast of sorts. Where most people think of water as a mundane beverage, Riese finds luxury and complexity. A couple of years ago, it was Riese who was recruited by GQ Magazine to track down a $100,000 diamond-encrusted bottle of water for Thirst Influencers Diplo and 2Chainz. Riese first discovered he had a thirst for water knowledge while vacationing with his parents as a young child. “This was, for me, mind-blowing that even tap water tasted differently from different cities in Europe,” Riese says. However, it wasn’t until 2005, while working at Berlin’s Michelin-starred restaurant, First Floor, that the light bulb clicked, thanks to a customer who asked him why they only served one brand of water but hundreds of wines. In his research, he contacted water producers to sample their beverages, did meticulous side-by-side taste tests, and conducted lots of online research. 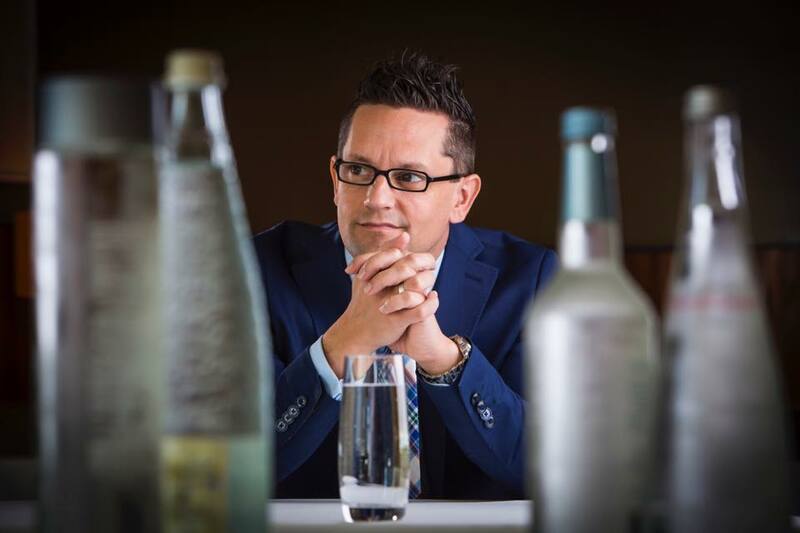 In 2009, he co-authored a book on water, and by 2010 became certified as a water sommelier by the German Mineral Water Trade Association. What were his findings? Flavor profiles, it turns out, will change depending on location, similarly to how wine is affected by terroir. Water is measured in TDS (total dissolved solids), or the amount of minerals it contains, Riese explains. Different combinations and amounts of magnesium, calcium, and potassium can affect the taste. For instance, glacier water tends to be smooth and fruity because they’re floating blocks of pure ice. On the other end of the spectrum, S.Pellegrino comes from natural springs that have made contact with underground rocks, thus causing it to taste a tad salty from the higher mineral content. Throughout his career, Riese has sampled over 1,000 varieties of water from all over the world, making him a man of particular tastes. The melted result of a summertime harvest of a 15,000-year-old Canadian iceberg, Berg water, Riese will tell you, is as "extremely smooth on your palate, like literally, extremely, smooth.” If a restaurant only offers the kind of H20 he loathes, he’ll leave. At home, he chills his bottled water in a wine fridge set at 59 degrees Fahrenheit. And believe us, he’s not a fan of adding ice and lemon wedges to water. With a palate like Riese’s, you won’t find him seeking out New York or L.A. tap. But, contrary to popular belief, he insists that there are times when tap is better than bottled spring. That's not the only surprising #knowledgedart our country's foremost water expert dropped on us. Here, Riese debunks 8 major myths behind our world's most ubiquitous beverage. Myth: All water mostly tastes the same. Riese says: “This is my big takeaway: all bottled waters are not the same. There are two huge differences that you can see right away on the label because [water producers] have to label it. When it says ‘purified water,’ that means it’s nothing more than municipal-sourced water; it’s filtered tap water [and they add] back a low level of electrolytes. The electrolytes, or TDS levels in general, are under 40. All the purified water companies are kind of the same because they're all using the same ideas: distilling everything or filtering everything out and then putting little amounts of minerals [back in]. Myth: Carbonated water can leach calcium from your body and teeth. Myth: The shape of your water glass doesn't matter. Myth: Bottled spring water is better than tap water. Myth: Charging over $20 for a bottle of water is ridiculous. Riese says: “I totally understand some people would say they were raised on tap water, and that they never thought bottled water, or even water [period], could have value to them. When I started the water program here for the Patina Restaurant Group, our purchasing director said, ‘Martin, you will never ever sell a bottle for $20. America will never buy it.’ And I proved him completely wrong because I cannot even order it as fast as I'm selling. People are so intrigued about the history of this water and they really want to taste it. Berg, for instance, is only harvesting this iceberg in the summertime in Canada. During the country’s extremely cold winters, this water isn’t even accessible because the [carbonation] would pop the glass bottles. Berg is pulling these icebergs away and then diluting them very slowly. The bottle is so expensive because it’s very hard to harvest." Myth: Tap water is healthy to drink if you use a filtration system at home. Riese says: “For drinking purposes, I totally understand why people buy filtration systems. But you should first look at your water quality and then buy the right filtration system based on that what you want to take out. Not every single filtration system is the same. You can go to grocery stores or Ebay to buy water-test kits to check for minerals like calcium, sodium, magnesium, or pH levels. But when it comes to [tracking] chemicals, it’s very hard to really know what’s in your water because you need to know beforehand what you’re looking for. That’s when you should talk to a professional. Myth: If you want to fight the drought in California, fight bottled water. Myth: National parks protect us by banning bottled water. Riese says: “Yosemite and some other national parks forbade [the sale of] bottled water. They think you should reuse the bottle and refill it with tap. [University of Vermont did a study] and found that this whole bottled-water ban is no good. So first of all, let’s face it: We’re all humans, we’re lazy. We will forget to bring our reusable bottle to a national park, and then we have to buy a bottled water. So when [national parks are] forbidding the sale of bottled water in vending machines but still selling sodas, you will suddenly buy a soda again. The study showed that nobody changed their habits of buying a bottled beverage in national parks. So the soda companies thought, Well, how cool is that? It’s nice to have that problem because we’re suddenly selling more sodas again. So right now in Yosemite, it’s OK to sell a harmful soda—we all know sodas are harmful for our bodies—but it’s not OK to sell a healthy beverage. It’s completely insane. It’s completely bizarre." Page Myth: Bottled spring water is better than tap water. Page Myth: Tap water is healthy to drink if you use a filtration system at home.